Regardless of your thoughts on the Cupertino company, you have to admit that when Apple introduced the world to the first iPhone in 2007, it ushered in a new era of smartphones. The fledgling touchscreen technology was given a shot in the arm with Apple's multitouch technology, which allowed screens to recognise more than one finger at a time, enabling gestures such as pinching to zoom in and out on a page - something that now feels like second nature. The inclusion of a full on-screen QWERTY keyboard was also viewed as a risk. Could touchscreens REALLY hope to replace the physical keyboard found on BlackBerrys? The original iPhone, which we described as having "the power of a super sub-compact Mac", also allowed us to view web pages much like they appeared on desktop PCs, delivering attractive and image-rich websites that thankfully banished memories of WAP browsing. The original iPhone wasn't perfect, as it skipped the burgeoning 3G that would make browsing when not on Wi-Fi more palatable. Meanwhile its seven hours of battery life was an indication that week-long battery charges were a thing of the past. Can you recall your first encounter with a computer, and how empowered you felt? That feeling that one device could change your world. If you've yearned for that feeling, get an iPhone. The iPhone demonstrates Apple 's ingenuity and keen sense of technical design. What the iPhone does right, it does outstandingly, so much so that it will lead you to overlook its considerable shortcomings. The first feature that exemplifies the iPhone's excellence: Apple's MultiTouch touchscreen technology. MultiTouch will prove to be a model for touchface interfaces in the future. MultiTouch succeeds because it uses natural movements: a pinching motion for zooming in and out, a flick up or down for fast scrolling, single and double taps. MultiTouch avoids awkward movements. The onscreen Qwerty keyboard, a concern for sceptics, has its learning curve but it's not unusable. You need to develop a sense of where your finger (skin, not your fingernail) touches the key. Some of us quickly adapted to the on-screen keyboard, while others will need days to learn the keyboard's nuances. Once mastered, you'll realise the concern was overstated. The iPhone 3.5-inch screen dazzles. Colour pops on the screen, and the text detail may be some of the best seen compared to similar devices. Skin tones look realistic and smooth in photos and videos, and we didn't notice any ghosting. In fact, the image quality is so good that you can enjoy a two-hour movie, even if you believe that movies were made for big screens. A commercially-made DVD movie that we ripped to our Mac using Handbrake and formatted as an iPod movie played on the iPhone flawlessly. iPhone management is done through a USB connection on Mac or Windows (the iPhone is incompatible with 64-bit Windows Vista ) using iTunes . Not only are your iPod files organised in iTunes, but you also determine your Calendar and Address Book settings there, too. The iPhone is compatible with Address Book, iCal under Mac OS X , and Microsoft Entourage on the Mac. On Windows, iPhone works with Microsoft Outlook. Apple touts a web experience on the iPhone without the compromises you usually make with smartphones. In actuality, the iPhone web experience is glorious yet has its own set of compromises. You see web pages as you would on a computer, and text and pictures look spectacular. However, load a site that requires plug-ins such as Adobe Flash, and you see missing plug-in messages. Apple won't comment on why the iPhone's Safari browser is crippled this way, but perhaps AT&T's EDGE network isn't fast enough for streaming media. That brings us to the greatest obstacle that prevents the iPhone from offering the best web experience in a mobile device. On AT&T's EDGE network and even on a Wi-Fi connection, the speeds feel modem-like. Supported email services include Yahoo, Google Mail, .Mac, and AOL. You can also enter settings for IMAP, POP, and Microsoft Exchange (IMAP only, and the Exchange server must have update Rollup 3 installed). You can view HTML emails, but you can't mark emails as spam. We were able to set up accounts quickly, but we did have some performance lag while typing email messages. The phone sound quality is clear but muted, and we didn't experience static or dropouts while using the phone in San Francisco. The music and video sound quality using earbuds is iPod-like, while the built-in speaker lacks richness and bass response but can get loud. Like its iPod siblings, the iPhone battery can't be removed. In our continuous talk test, the battery lasted just over seven hours. The iPod played music for nearly 23 hours and videos for 6 hours, 15 minutes. All good tallies that fall short of each of Apple's specifications by about an hour. Underneath the iPhone software is Mac OS X, and the iPhone feel like it has the power of a super sub-compact Mac. Unlike the MacBook and other Macs, the iPhone doesn't use an Intel processor. It uses a Samsung-manufactured ARM chip and it has 512MB of SDRAM to run the OS. The ARM processor is quite snappy; you can zip through the iPhone interface without any delays. Some tasks, such as opening email attachments and Cover Flow, feel faster than on an Intel 2GHz Core 2 Duo MacBook. Despite the Mac OS X underpinnings, customisation is limited. You can't change the display font or font size or reorganise the application icons on the home page. You can't create custom ringtones or use MP3 ringtones. Another limitation: Apple won't allow third-party developers to create true OS X applications. Instead, Apple allows development of Ajax-based web apps that run using Safari. The SIM card is stored in a slot atop the iPhone. You insert a paperclip into a hole, and out pops the SIM card caddy with the card. You can't unlock the iPhone and use cards from other phones. The iPhone headphone jack is recessed, which will prevent you from using some third-party earphones. The iPhone's Bluetooth can be used only with a phone headset and can't be used to transfer files, sync, or listen to the iPod via Bluetooth earphones. The more we use the iPhone, the more our affection grows for it. You can't say that about many things you use in your life. What makes the iPhone such a exciting device is its elegance. From its glossy exterior, to its intuitive interface, snappy response times, and sensible navigation, the iPhone simply works. Yes, the iPhone has many shortcomings. Its slow EDGE connectivity is a deal breaker. The Safari web browser needs to be updated for plug-in functionality. Its limited Bluetooth capabilities make no sense. Perhaps iPhone 2.0's the better deal for you. But if you're willing to make a few compromises, you won't be sorry. The iPhone has changed the mobile device landscape. For the better. 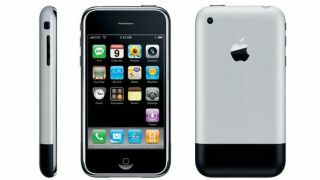 We scored the original iPhone 4 out of 5 in our review first published June 2007.